Now you are humming that song while you read this, or are so young that you are having to Google it!! I am so incredibly behind on my planting this year! I typically get my flowers and garden planted just after Mother’s Day. In the part of the universe I live in, that is when we can be fairly confident that it won’t frost or even snow anymore. But, here I am nearly a month late…the herbs that I had moved indoors for the winter were looking distressed and begging for fresh air and sunshine. So, I set out to the local greenhouses in search of a few more herbs and some vegetable plants, along with some hanging baskets to adorn my very un-springlike looking porch. What I find is very disheartening (as you can see from the photos!). Slim pickings and some real question about whether what’s left is even salvageable. However, I am determined. The one positive is that the plants are cheap. The owner at one local greenhouse said he’d actually just give me the herbs I wanted, but his wife would kill him. I walked away with four slightly wilted but fairly large herb starts for a single dollar bill and a smile. Feeling confident that I have just enough of a green thumb to rescue these poor plants, I gathered my tools and got my container garden planted. Use good dirt. Now, that doesn’t mean that you have to invest big dollars in the highest quality bag of soil you can find. In fact, I use the dirt left from the years before with a little extra added when needed. It does mean though that the soil should be free from weeds, sticks and whatever those maple tree seed pod whirly-gig things are actually called. I am also sure to clean out any bunches of dead roots that are left from the prior years plants. Feed the plants. I get an inexpensive slow release plant food and weed killer that you just sprinkle in the dirt. I dampen the soil and then use a hand shovel to mix in the food. I have also heard that a little bit a coffee grounds and crushed egg shells can give the soil the nutrients it needs. Don’t crowd the containers. You want to leave room for the roots to spread and the plant to grow, and you don’t want the plants competing for food, water and sun. Speaking of sun, be sure to note how much your plants can handle. Most herbs need or can handle partial to full sunlight. The pepper plants and tomato plants I get are also good with quite a bit of sun. My container garden is on the south side of my house and not shaded. The biggest key to growing a great container garden is watering. Be sure that you have a drainage system so the roots don’t rot. Holes in the container along with rocks under the soil work well. Most herbs need to be in damp soil at all times. Depending upon the weather, I typically water once to twice a day. I am certain to water early in the morning and in the evening to avoid the direct heat and sun of the day. Protect from bugs. There are a wide variety of six legged creatures that like to inhabit my garden and munch on my plants, so I get an organic spray that I put on once a week that keeps the bugs off but is safe for plants that will be consumed. 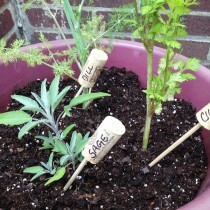 I plant all of the herbs that I regularly use: Rosemary, Chives, Basil, Thyme, Sage, Mint, Parsley, Cilantro and Dill. Because I cook with them regularly, I don’t usually have to be concerned about having too much, but if I do find I am not using enough of something to require regular pruning (which inspires new growth), then I dry or freeze the extra. Here are a couple of the easiest methods. Preheat your oven to the lowest setting (between 145-175 degrees). Place the herbs on a baking sheet. Put in the oven on the middle rack. Turn off the oven. It will take about 1-2 hours to dry depending upon the moisture in the herb. Check on them periodically. You can either chop the herbs or leave them in larger leaves or sprigs. Nearly fill an ice cube tray with the herb. Pour in olive oil. I use typically use my favorite a mild Picholine from The Olive Twist, a local oil and vinegar shop. However recently, they have been unable to get that variety, so I am using an Arbosana EVOO that I like for it’s slightly peppery flavor. You can also use melted, unsalted butter. Freeze the “cubes” then remove them from the tray and store them in the freezer in a resealable freezer bag. These are great because most recipes that call for the herbs also call for some type of oil. Imagine the wonderful scents when you toss an herb infused oil cube in a pan to sauté onions and garlic…Mmm! You can even pre-mix some of your favorite combinations such a parsley, sage and thyme. Because I sometimes send my ten year old son out to clip me the herbs I need, and because it looks nice, I find a creative way to label my plants. This year I used one of the trillions of ideas I gained from Pinterest, and used wine bottle corks to make labels. I even have a wine bottle filled with water in the largest of my containers to provide slow watering. Harvesting your own herbs is very handy and economical, especially if you only need a small amount at a time for a recipe. Enjoy growing your container garden and preserving herbs for use all year ’round!! Love your herb container garden! I do NOT have a green thumb and stick to container gardening - with mixed success. I love your wine cork naming system! Loved this article - shared with my folks on facebook! Put you on my "Blogs I love!" blogroll as well! Love the fresh herbs, veggie and GARLIC ideas! Yum!